On October 5, 2000, the regular presidential election process in Yugoslavia was boisterously interrupted by what Western media described as a “democratic revolution” against the “dictator”, president Slobodan Milosevic. In reality, the “dictator” was about to enter the run-off round of the Yugoslav presidential election which he appeared likely to lose to the main opposition candidate, Vojislav Kostunica. Rather than support the democratic electoral process, the United States trained and incited activists to take to the streets and replace it by a televised spectacle of popular uprising. Probably, the scenarists modeled this show on the equally stage-managed overthrow of the Ceaucescu couple in Rumania at Christmas 1989, which ended in their murder following one of the shortest kangaroo court trials in history. For the generally ignorant world at large, being overthrown in an uprising was meant to prove that Milosevic was really a “dictator” like Ceaucescu. Being defeated in an election would have tended to prove the opposite. In contrast to Ceaucescu, the murder of Milosevic was accomplished slowly, indirectly, over many years. But October 5 marked the day on which effective political power in Yugoslavia was seized by foreign Great Powers, mainly by the United States. Proclaimed president in confused circumstances, Kostunica was weakened from the start. The Western favorite, Zoran Djindjic, was installed as Serbian prime minister and a few months later violated the Serbian constitution by turning Milosevic over to the International Criminal Tribunal for Former Yugoslavia (ICTY) in The Hague – for one of the longest kangaroo court trials in history. The self-styled “Democratic” politicians in Belgrade labored under the illusion that throwing Milosevic to the ICTY wolves would be enough to ensure the good graces of the “International Community”. But that was not enough, and the demands for more have continued to this day. Sending Milosevic, Generals Nebojsa Pavkovic, Sreten Lukic, Vladimir Lazarevic and Dragoljub Ojdanic, Admiral Miodrag Jokic, Radovan Karadzic and Vojislav Seselj, among others, has done nothing to remove the stigma from Serbia. On the contrary, cooperation with The Hague tribunal has above all served to confirm Serbia’s collective guilt. After all, if even Serbs consider their own leader responsible for all the wars in Yugoslavia, who else will object? The trumped up theory of a “joint criminal enterprise” to create “Greater Serbia” was used to blame every aspect of the breakup of Yugoslavia on an imaginary Serbian conspiracy. The scapegoat turned out to be not just Milosevic, but Serbia itself. Serbia’s guilt for everything that went wrong in the Balkans was the essential propaganda line used to justify the 1999 NATO aggression, and by implicitly endorsing this guilt, the “democratic” leaders effectively undermined Serbia’s moral claim to Kosovo. In June 1999, as bombs were destroying bridges and factories, Milosevic gave in and allowed NATO to occupy Kosovo under threat of carpet bombing that would destroy Serbia entirely. But he set conditions – which the United States proceeded to ignore. His successors surrendered unconditionally, and fled from a less perilous battle – the battle to inform world public opinion of the complex truth of the Balkans. Not only the “Democratic” leaders, but many Serbs who could not understand why NATO bombed their country preferred to echo the NATO line, in order to escape from isolation. They would say, what happened in Yugoslavia was all the fault of one man, Slobodan Milosevic. But we are not like him, we are nice. Get rid of him, and all will be well. That did not work because the diagnosis of the problem was wrong. By a complex convergence of events, Yugoslavia served as an experimental field for the American project to remake the world. Yugoslavia was an experimental field for hard power, in the bombing of Yugoslavia, but also and even more so for soft power: propaganda and manipulation. Techniques tried out in Yugoslavia were later used in one country after another – notably the “color revolutions” which began in Belgrade on that October 5. 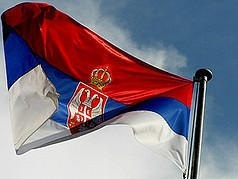 Serbia has been and continued to be the victim of an historic injustice and the object of ongoing slander. It is understandable, probably inevitable that Serbs try to escape from this intolerable present by projecting themselves into a mythical heroic past or a mythical idyllic future within the European Union. To some extent this may reflect a generational split, with an older generation recalling the mythical past and the younger generation anticipating the mythical future. Meanwhile, I have the impression that Serbia’s pro-Western leaders are very confused about the present. It strikes me that these leaders, who identify so closely with the West, totally fail to understand it. Sometimes I have the impression that the Serbian bourgeoisie identifies with a kinder, gentler America that may have existed in the past, but does not exist today. They appear to believe, quite sincerely, that being nice to the West, the West will be nice to them. They don’t know with whom they are dealing. They don’t seem to have heard of a familiar American saying, “Nice guys finish last”. In this ruthless world, being nice simply means that you are a loser, and that it costs nothing to keep cheating and beating you. The United States and its NATO satellites are engaged in a world conquest of a new kind. It is active everywhere and yet almost invisible. The grotesquely enormous U.S. military machine continues to seek “full-spectrum” military superiority to control everything that goes on from underground to outer space, with close to one thousand overseas military bases around the globe, and vigorous programs to transform the erstwhile defense forces of other countries into specialized “tool boxes” for use in whatever war the U.S. may see fit to start anywhere in the world. Every day the United States engages in joint military exercises with client States at some point or another on the globe. Being an ally of the United States entails being unable to defend oneself, but being able to help the United States attack some other country. And nice guys finish last. Serbia’s stigmatization continues. Western newspapers ignore Serbia unless there is something negative to say. In France, the weather maps that show temperatures in world capitals skip over Serbia – a non-country. The only ones who manage to break through this barrier are tennis stars – apparently the sports world has its own autonomy. But not everyone in Serbia can be a tennis star. Outside the tennis courts, Serbia continues to bear the stigma of “extreme nationalism”, “ethnic cleansing”, “the worst massacre in Europe since World War II”, even “genocide”. The persistence of this stigmatization calls for explanation. It was only a few years after the end of World War II that the Federal Republic of Germany was accepted into NATO and recognized as an ally of the West. The rapidity of Germany’s rehabilitation had two reasons which do not apply to Serbia. First of all, Germany was an industrial power-house, an economic power whose recovery was essential to the economy of the victorious United States itself. Second, there was the common enemy: the Soviet Union. Some Serbs have obviously hoped that the “common enemy” factor could help rehabilitate Serbia. The common enemy being, in this case, Islam. Some admirable friends of Serbia entertain this hope, quite sincerely, but with all due respect I wish to voice objections to this approach. The myth of Serb “genocide” against Muslims serves to make US and Israeli wars against Muslims look almost humanitarian in comparison. To see things in terms of a conflict between the Christian West and the Muslim world plays into the hands of those who used Yugoslavia as their experimental laboratory for conquest. It fails to grasp the big picture. It points to the wrong enemy. It was not the Muslim world which destroyed Yugoslavia, it was NATO. It was not the Muslim world that detached Kosovo from Serbia, or could have done so – it was NATO. As a personal note, I must tell you that when I have visited Algeria and Libya, I have encountered intellectuals whose sympathy is with the old Yugoslavia and with Serbia. This is true also of Turkey, which may be more surprising. In the context of the NATO project of world conquest, the choices made by Serbia have broader significance than may be perceived. When Serbia turns its back on the rest of the world in its single-minded desire to win approval from the NATO powers that stole Kosovo, it is proving that aggression pays. Serbia will not be treated as an equal until it fights back on the propaganda front. So long as the nation is stigmatized as “genocidal”, it cannot make any claim to Kosovo, or to anything else. A pariah nation can only beg on its knees. “Who steals my purse steals trash… but he that filches from me my good name robs me of that which not enriches him, and makes me poor indeed.” Let me say that the loss of Kosovo, however brutal and unjust, is minor compared to the loss of Serbia’s good name. Serbian leaders have set the wrong priorities, putting futile gestures to recover Kosovo ahead of serious efforts to restore Serbia’s reputation. Serbia does not have the military force to recapture Kosovo from NATO. It cannot fight successfully on the hard power battlefield. But it could at least try to fight on the battleground of words, images, ideas. The totally biased trials in The Hague were designed to justify NATO aggression by establishing Serbia’s guilt. And yet, the long trial of Milosevic, and the current endless trial of Vojislav Seselj, have failed to do so. However, this is hidden from world public opinion. The real faults of those defeated politicians are insignificant compared to the implications of their demonization. Serb patriots should make use of the testimony in those trials to establish the truth and restore Serbia’s honor. They should do research, write book, make films, talk to the world. Not only the world, but even more the younger generations of Serbs, should be made to understand the tragedy – not to weep, nor to seek revenge, but to know the truth and live in freedom, independence and dignity. Only the truth can make you free.